In the early days of molecular biology the key technique for discovering the structure of biological molecules was X-ray crystallography. While this yielded many wonderful structures, many others remained unsolved since the technique requires 3-D crystals of the molecule. 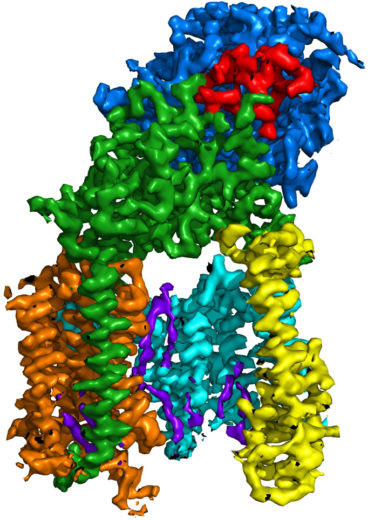 Very large molecular complexes and membrane proteins are particularly difficult to crystallise. From the early 1960s researchers started to use electron microscopy (EM), which bombards proteins or other large biological molecules with electrons rather than X-rays, to determine their atomic structure. Using EM, in 1975, Richard Henderson, along with fellow LMB researcher Nigel Unwin, successfully determined the first structure of 2-D crystals of the membrane protein bacteriorhodopsin. 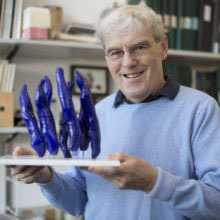 In the 1990s, Richard published a review showing that it would be theoretically possible to extract enough signal from randomly dispersed molecules using EM to obtain their detailed atomic structures. This insight and Richard’s drive and determination over the next two decades led to the development of better detectors for electron microscopes and better software to analyse the images, a key stage in the process. 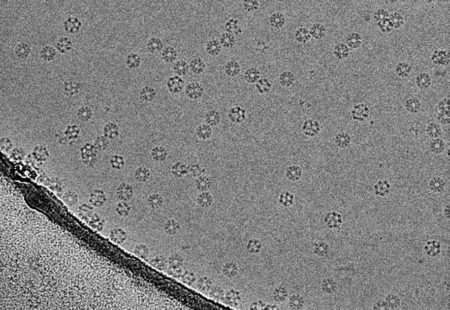 This revolutionised the technique of electron cryo-microscopy (cryo-EM), which involves flash-cooling molecules in a thin layer of aqueous solution before imaging them, a crucial method invented by Jacques Dubochet and his colleagues at EMBL in the early 1980s. In the last few years there has been a quantum leap in these imaging techniques, due to better microscopes, better electron detectors and better computer programs for calculating the structure from the images. These improvements are now allowing atomic structure determinations of many proteins and other macromolecular assemblies that were previously very difficult or impossible to obtain. The new structures provide important insights into biological functions and mechanisms, and will help enhance the study of diseases, such as neurodegenerative diseases, infectious diseases and cancer. Richard shared the Nobel Prize with Jacques Dubochet from the University of Lausanne, Switzerland and Joachim Frank from Columbia University, USA.